An original 1930 race aircraft, built for the U.S. National Air Races. Pete, a closed-course racer with a comparatively small 318-cubic-inch 90-horsepower Wright Gypsy. Gordon Israel handled the structural design of the airframe and assembled it as well. Its success can be measured by its win-ning five firsts and two thirds at its first out-ing, in 1930. And the two third-place finishes came in the 1,000-inch and unlimited-displacement classes. 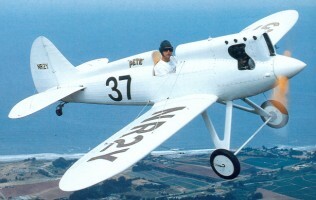 The DGA-3 Pete racer, was succeeded by DGA-4 Ike and DGA-5 Mike. Engine: Curtiss Wright Gipsy, 90 hp.